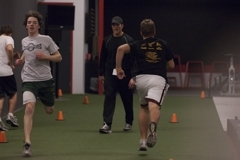 Slide-Boards work on a players skating stride, form and power. Synthetic-Ice Speed Ramp continues to work on a players stride, but focuses even more on the explosiveness of their first few steps. 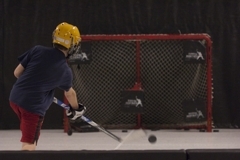 Shooting Lanes are used to work on a players shot quickness, power, and accuracy. 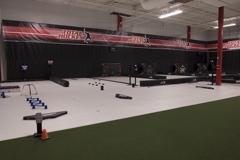 Stick-Handling Area is designed to work on all aspects of a player's puck control, including passing and puck handling. RECOMMENDED EQUIPMENT: Athletic clothing, athletic shoes, skates, stick, helmet, gloves, and water bottle. Multi-Player Discounts: Intended for players who want to train with their friends and/or family, and sign up together. NOTE: 50% Cancelation Fee if less than 24 Hours in advance.